Posted on March 23, 2019 by Family to the 5 Power! A couple of months ago, I saw the post below and I thought it was quite true. In recent days, I’ve been pondering just which “generation” the image is talking about. Sure, teens are featured here and we usually refer to them and young adults when talking about excessive phone use. But recently, I watched a senior citizen use social media with the addiction of a 15-year old. I was sitting at a NHL game, which was a real privilege to be enjoying the game with my son and husband. Our son had surprised us with tickets the day he arrived home for spring break. Seated directly in front of me, one row down was a grey haired man with a few friends. He was wearing a hockey jersey, so I assumed he must be a devout hockey fan who would really be into the game like the rest of us. Instead of watching the game, he watched his cell phone…placing it in and out of his jeans pocket no less than 30 times during the course of the 3-hour game (or at least it’s my best guess). At first, I thought it was great that he must be giving friends game updates, or maybe texting with his grandkids(?) about the game. Perhaps it was because he actually bothered to put the phone back into his jeans pocket every. single. time. after using it for a minute that I was really distracted when the puck was on our end of the ice. Arena seats are tight after all, and you can’t help but notice each other’s business. The dude’s shoulders nearly touched my knees. Every time my eyes followed the puck back down our way, the guy’s fingers were perusing Snapchat and Instagram. Sending Snaps. Liking posts. Again and again and again. The speed of his fingers scrolling…the dexterity…really quite impressive! I couldn’t tell you what was being snapped or sent or liked. I wasn’t looking for the details. I just noticed a blur of constant motion involving the phone. Of course there was plenty of time that I was engrossed in the game or chatting with my son and wasn’t stalking the guy’s phone use. 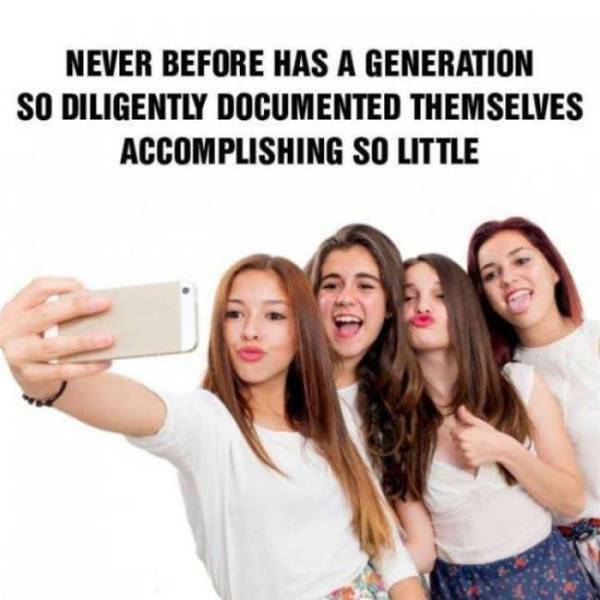 But when the continuous shifting of his body to put the phone back away did distract me, the above image of teens documenting their happenings came to mind more than once. I did a quick internet search of technology and phone use for adults 65 and over. This not-so-official research focused upon “the best cell phones for seniors” and “best apps for older people”. I think the youngins writing the articles need to start hanging out with us 50yr olds and definitely the 65 and over crowd before writing their next post. The half-century and over demographic is using many of the same apps and cell phones as the millennials. I caught a few minutes of a news segment recently where a 73-year old grandmother asked her daughter-in-law how she could stay more connected to her grandchildren who were now in their teens. The daughter-in-law told her to text daily and get on social media. The woman was crazy about her grandkids and was happy to go upgrade her phone to accommodate her new apps. I’m the first in a conversation to promote “old school” things like real books with touchable pages. I’m all about sitting together and playing actual games, not connecting on game apps via my phone. But, for those of us who’ve been around this planet awhile, we can’t deny that there has been a tectonic shift requiring some form of technology in virtually every aspect of human existence. We might initially balk at the changes and vow to “disconnect”, but even the most die-hard anti-technology people I know have joyfully embraced digital cameras and tossed film. They’ve also been forced to purchase ovens and washing machines with all-digital headboards. Even if we avoid constant technology in our personal life, working almost anywhere demands software proficiency. The next time I’m tempted to give a bad rap to the young adults whose phones might as well be an additional limb, I’ll no doubt think of the hockey guy and remind myself that no demographic is completely excluded from our virtual attachment. Photo is found in multiple locations online so photo credit goes to the Internet at large. Click image for one of the many locations. This entry was posted in 40-Something, 50-Something, blogging, college kids, middle age, Parenting, teenagers and tagged apps, cell phones, grandchildren, grandparents, hockey game, iphone, NHL, Parenting, parenting teens, phone addiction, phone use, senior citizen, senior citizens, social media, technology, teenagers, teens, texting by Family to the 5 Power!. Bookmark the permalink. It is sad when technology has us so addicted that we can’t even put our phones away for the length of a game, meal, or person-to-person conversation. Technology is important but there does need to be a balance. I’m as guilty as the next person, though I do give myself some limits. I try to never use my phone in the check out line. I think that is disrespectful to the clerk. I put my phone away for friend lunches so I can really listen. I try not to carry my phone around at home which isn’t always easy because my sweet husband does text me throughout his work day and he’s in another state at the moment. It’s hard not to be so dependent on our cell phones! Great post. That is wonderful that you are courteous of the clerks at check out lines. Technology is a blessing to keep in touch when our family members are away. You are right that the key is “balance”. Thanks for your thoughtful comment! Very true!We do have to move forward and learn all the new technology but I do worry about cell phones’ addictive nature. A number of years ago, we were waiting for a table at a very busy restaurant and as I looked around at the 30 or more people also waiting, every one of them but me were on their cell phones. And most of them were older adults and some senior citizens. I do use my cell for keeping in touch but I have very few apps on it. I agree wholeheartedly with the comment above — when an app becomes more important than enjoying what’s around you and the people you are with, you’re addicted! I agree too. When others are with us, we must be present. We can’t get that time back with them. Your story about the restaurant is crazy! And that was “a number of years ago”! I love the reruns of Leave it to Beaver when the Cleavers go out to dinner. My kids laugh at how dressed up and proper everyone is at the table. Going out to dinner used to be special! I noticed this, too at a women’s conference I attended recently. I was amazed at how many women were on their phones the entire time the speakers were on stage! The conference wasn’t cheap and there’s no way I would have paid that amount of money to sit and stare at my phone all day. When an app becomes more important than the events and people around you, it’s time to put away the digital. You are so right and I completely agree with you! Thanks for your comment. I must admit I had to literally put away all devices 2 realize how I have come to depend upon them. My grandchildren all live at least two hour flights away from me, show technology has kept us close together while I must be this far from them physically. even so, after the Techno fast I was glad to hear that my grandchildren missed my texts and photos. Hah, I think this is such a good point! Shame that guy missed the game while on his phone all the time though. My mother was a total technophobe until I gave her my iPhone about 2 years ago, as she was struggling to use a basic phone with her hands (arthritis) and I thought it’d be good for her to have something really easy to use and where she can take photos, too. Then I got her a Fire tablet for Christmas the year before last. Now, she’s on both all the time. She uses the news apps on the tablet and goes on WhatsApp to message me when I’m in hospital. On more than one occasion now she’s burned her dinner because she’s been on the news apps and couldn’t pull herself away from them! 😄Burning dinner because she can’t leave the news app made me laugh! How funny that only two short years ago she was a technophobe. Once someone is acclimated to the apps and Internet sources, they’re hooked! Definitely true. I play board games with people in their 40s through 60s and half of them can’t keep from staring at their phones throughout. Some are so antsy they play games on their phones during the board games because they can’t bear a minute of being unstimulated. Wow, virtual playing while actually playing?! I would be frustrated by that. They need the rule I give my kids for meals and games: no phones at the table! Thanks for your comment.